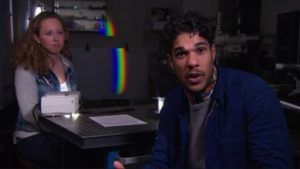 Find here my video on the electromagnetic spectrum made for high-school physics in the Netherlands, aimed at 12-14 year olds. I explain in basic physics the electromagnetic spectrum and how a radio telescope works. We observe a pulsar with the Dwingeloo Radio Telescope. This video is part of the SchoolTV class package on ‘space-experts’.